We do get ready. 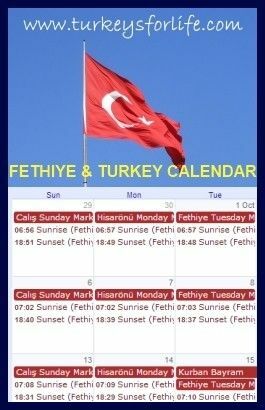 Names and dates are dutifully added to our Google calendar and then we start to match ideas of things to do in Fethiye with the people coming out. Some just wanna crash out all day by the pool, others want to go off and explore and others like to do activities in and around town. At some point during any summer, Sultan’s Aqua City, in Çalış, appears on the agenda. 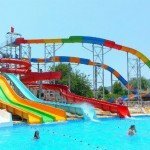 Online reviews of Fethiye water parks are always very mixed, as we mentioned in our post about the aquapark in Ovacık, Ölüdeniz Water World. It must come down to people’s expectations – what they want it to be like before they’ve experienced it, and what they actually experience. What Is Sultan’s Aqua City Not? 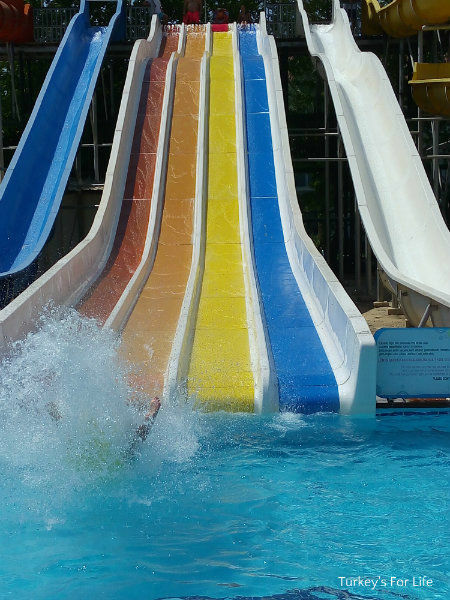 So let’s just say right now what Sultan’s Aqua City in Çalış is not: It’s not a huge, sprawling mass of water slides and pools of the type you get in the US or large holiday resorts in Europe elsewhere in Turkey. If you know it, you’ll be agreeing with us. Aquapark fun is centred very much around the water slides – those things that I have a huge fear of – and that was definitely the case with our last visit there in early September. We were with a couple of friends and their 5 year old son. It was the typical scenario where the lines blurred as to the who the kids were: the 5 year old or Barry and his friend, James. Sultan’s Aqua City’s 4 lane water slide in the centre became a race track for them, building to the crescendo of who could make the most ridiculous splash on hitting the water at the bottom. R u ready for the big splash? Never have I witnessed Barry landing in the water at any sort of sensible pace or position. Sultan’s Aqua City’s tagline is ‘R U Ready For The Big Splash?’ And these 4 lanes of water slide in the photo above, as well as the blue and white on either side, are where you will witness grown men of various shapes and sizes hurtling down the slides before creating a mini tsunami at the bottom. Tip: If you’re waiting at the bottom with camera to take photos of your kids, friends etc, and you’re not using anything waterproof, stand well back and use your zoom. The splashes are great fun but can reach a distance. Of course, there are kids and other people just enjoying the fun of the slides and a gentle plunge into the pool at the bottom. All is supervised by the lifeguards at the top and the bottom. Take a mat to sit on if you want to go fast. No mat if you prefer an easier pace in your sliding experience. If you like a swirly water slide, Sultan’s Aqua City has a pitch black one that I can only imagine. The yellow one you can see in the photo above is good for kids. And then there’s a relatively new addition – pink and orange one in the top photo – that requires the use of inflatables, too. And then, over the other side of Sultan’s Aqua City, there’s the snake! Does he look friendly to you? 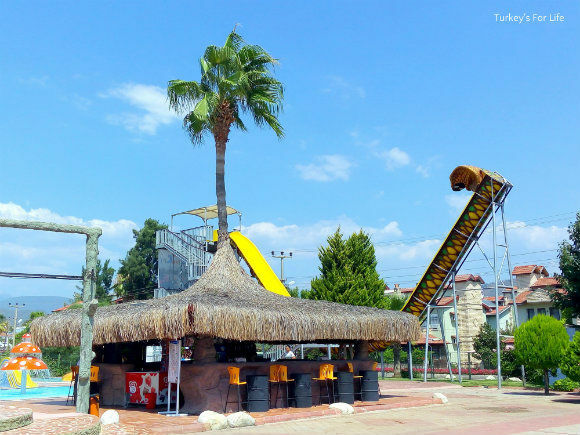 This doughnut slide always makes us laugh because it’s right by the edge of Sultan’s Aqua City, next to the main road and pavement in Çalış. Passersby can just look up and witness either excitement or fear as people edge their doughnut onto the steep drop of the slide. Some scream as the doughnut is released – joy or fear. Take your pick. This is where there’s a bit of an advantage to Sultan’s Aqua City not having a sprawling land mass. There are two small pools for the kids to use with small slides and a fountain. You can use sun loungers and umbrellas around here. And, if you’ve got older kids wanting to be on the big main slides, you know they’re close by. The snake slide is right next to this children’s area, for example. Also, happy days, this photo above was taken from my bar stool! Food and drink can be ordered from the bar and the kids are still close by. We tried our best to entice our friend’s son to come and have a bit of food and a drink. But he just didn’t want to leave the water. So we ordered our goodies without having to move away from him. Ahh, yes, this is the part where I can write from personal experience rather than relaying what Barry and his mates get up to. There are loads of sun loungers and umbrellas at Sultan’s Aqua City; many of them around the pool and the slides. We usually get a bed around the pool so that I can entertain myself with the occasional cool off and swim whilst everyone else is off sliding. The pool is a decent size, and, if you’re like me and not much into throwing yourself down almost vertical watery drops, it keeps you occupied. And the great thing is, because most people are off sliding, you’re only sharing the space with a few other non-sliding bathers. The only time it gets anything like crowded is when the slides are turned off for 30 minutes or so every few hours. If you’re with kids, there are loads of kids drinks, milkshakes, ice creams and meals for them to choose from. As we said though, we struggled to get our friends’ son out of the water or off the slides so we ended up just keeping a drink to one side for him, just to get him to have a few sips every so often. A few times each day, special offers on drinks and ice creams are announced so you get a bit more for your money, too. For those of you who like a bit of alcohol content to your beverages when you’re having a day in a water park, Sultan’s Aqua City has a full bar, so there’s lots to choose from. If you’re staying in Çalış, you might find drinks slightly more expensive than some bars. If you’re in Fethiye, you’ll probably be pleasantly surprised by the prices inside the water park. It’s not super expensive, is what we’re saying. As you’d expect, there are burgers and the like on the menu, but there are also lots of other choices. Kebabs, pizzas, pasta dishes, sandwiches, omelettes and salads. So, no need to go in there thinking you’re going to be forced to eat junk food because there are no other options. Having said that, when we’ve been with friends, we do usually opt for a burger and, as you can see in the photo, one friend likes to order some good old döner meat. We do have one friend though who is a big salad fan so at least you get to see one of the salad offerings. Quite impressive that you get all the dressings brought to your bed, too. Sultan’s Aqua City often does wedding parties in the evenings so they’re well-versed in catering for large numbers. Sultan’s Aqua City is on Mustafa Kemal Bulvarı in Çalış, Fethiye. The water park is on the Sahilden dolmuş route or it is walking distance from the hotels around Çalış. Transfers are also available from some hotels. Sultan’s Aqua City Entrance Fees differ between age groups. 0-4 yr olds are free. Changing rooms, shower blocks, WC, slides, beds and umbrellas are all included in the entrance fee. Drinks and food are separate. In Sterling, expect entrance prices of around £10 per adult and £8 for 5-15 year olds. Food and drink is bought with a prepaid card and any unspent funds are returned to you when you return the card. You can top it up if need be. For the 2017 summer season, Sultan’s Aqua City will open at the end of May. Click into our dedicated page for more ideas of what to do in Fethiye. What Sultan’s Aqua City lacks in space, it makes up for in character, @Krista. 🙂 And yeah, very clean.